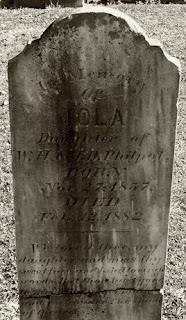 The tombstone pictured and transcribed above can be found in Oak Hill Cemetery; Talbotton, Georgia. The epitaph is very loving. One thing that stood out to me was the quoted phrase, "The shade of the trees." I was curious about it and performed a search on the phrase. I have a hunch it is from a portion of the last words of Stonewall Jackson: "Let us cross over the river and rest under the shade of the trees." It fits the time frame of Iola's life well. Here is a poem I found in an 1867 book, The Southern Poems of the War by Emily Virginia Mason. The only reference to an author is above the poem: "By James." Any of the lines from this poem would be a befitting epitaph. To battle for liberty, country, and home! As his spirit approaches the river of death! "Over the river, 'neath the shade of the trees,"
And dwell in the mansions the Saviour hath made. "Over the river," in the home of the blest. And his brow will be wreathed with the victor's bright crown. "Over the river," now a Heavenly guest! "'Neath the shade of the trees," forever at rest! The praises of Him who of Kings is the King!